The Northmont boys swim team poses with its GWOC West Division 1st place trophy. TROTWOOD — On Saturday, January 26, several area swim teams competed in the GWOC National League meet at Trotwood-Madison high school. 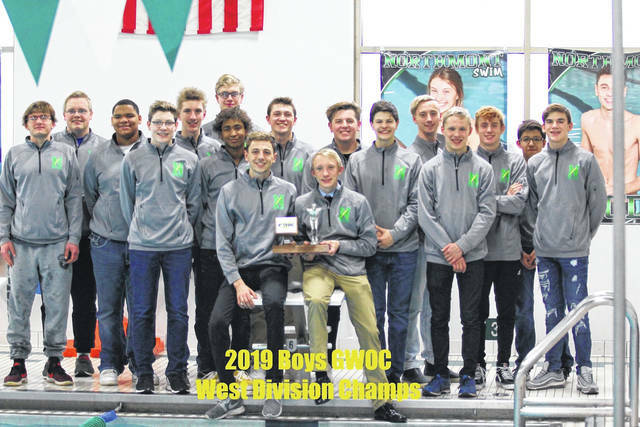 The Northmont boys’ team won the West Division within the GWOC National League, which includes Springboro, Miamisburg, and Lebanon. Centerville High School was the overall winner of the National League. In individual events, freshman John Hoyng had a great meet, placing in the top ten swimmers in both of his events – seventh in the 100 yard butterfly and ninth in the 100 yard freestyle. Jonah Mergler placed ninth in the 100 yard butterfly, Josiah English placed ninth in the 100 yard backstroke, and Cameron Roberts finished seventh in the 100 yard breast stroke. For the girls, Fynn Roberts placed seventh in the 100 yard breast stroke. Several of Northmont’s relay teams also finished in the top ten. The girls’ 200 yard medley relay team of Lindsey Dresnek, Fynn Roberts, and Phoebe and Isabelle Caraway finished in ninth place. Roberts, Olivia Jones, and Phoebe and Isabelle Caraway teamed up for the 200 yard freestyle relay and finished tenth. In the boys’ 200 yard medley relay, Northmont’s team of English, Cameron Roberts, Mergler, and Hoyng finished sixth, while the relay team of Eric Woods, Joey McKarns, Kyle DeLano, and Jonah Scoville placed ninth. Northmont’s boys took sixth in the 400 yard freestyle relay with the team of Roberts, Mitch Asbury, English, and Hoyng. In the 200 yard freestyle relay, Northmont boys took seventh with the team of Mergler, Asbury, McKarns, and DeLano, as well as eighth with the team of Scoville, Cole Rife, Nick Sanders, and Eric Woods. The Northmont swimmers who qualified in their individual and relay events will go on to the GWOC All-Conference meet, scheduled for Thursday, January 31 at Trotwood-Madison.